A retired RCMP officer, Ken Burton wrote Canada's Arctic: A Guide to Adventure Through the Northwest Passage (Pacific Marine 2018). Starting from Unalaska in Alaska and carrying on through the Northwest Passage to Greenland, Burton explores the highlights, histories and people along the way. During his more than 30 years as a policeman, Burton held a variety of roles including as captain on various RCMP coastal patrol vessels. As captain of the RCMP vessel St. Roch II, he visited many places and historic settlements in the Canadian Arctic. In retirement, he became a veteran boater, Arctic guide, photographer and lecturer. He returns often to the Northwest Passage aboard cruise ships and other vessels. In 2000, Burton captained a non-ice-reinforced vessel on a continuous circumnavigation of the North American continent in one season. 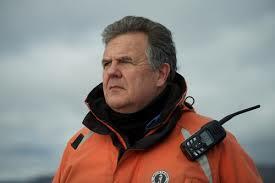 He has also served as executive director of the Vancouver Maritime Museum for several years.